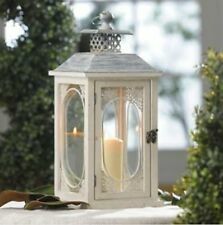 The romantic Antiqued Cream Lantern features a gorgeous. illuminating that pattern on this beautiful lantern. Hinged lantern door. Distressed cream finish. Large long Halloween candle centerpiece for votives abt. 23"
This is a long witch-pumpkin "train" that pulls 6 colored glass votive candle holders (candles not included). The pumpkin on front is tin and the witch on back is tin. Wheels still turn and roll. Set is 23" long, or a tad over, and would make a great Halloween centerpiece on your table or coffee table. G o rgeous pumpkin candle holder with leaf cut-outs for the light to shine through. You will need to place your own tea light in the holder to enjoy. FOR SALE IS A NEW KIRKLAND'S 14" TALL PILLAR CANDLE HOLDER. MODEL: STICK TWISTED. BRONZE WITH COPPER HIGHLIGHTS. New in box Kirkland's antique bronze color metal runner with six clear glass votives. Candles are not included. Brand new but box is worn. Measures 20.67 inches long and 5.32 inches wide. The votives are very nice, thick glass. Please inspect all photos. Thanks for looking! 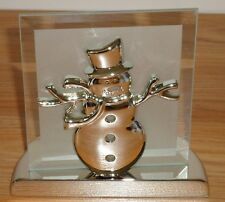 KIRKLANDS 3 Chocolate Mercury Hurricane Candle Holders HomeAccent OpenBox 11-16"
Gorgeous!!! Open box but brand new!!! No issues! Thanks for looking!!! 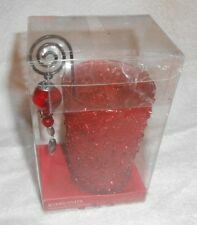 THIS SALE IS FOR KIRKLAND SET OF 3 CHRISTMAS RED VOTIVE CANDLE HOLDER. Very good condition. I don't believe it was ever used. Kirkland's Beaded Tealight Holder with Dangle. 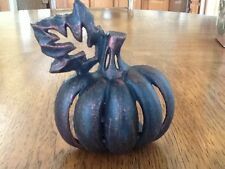 Cast iron pumpkin tealight candle holder. Harvest Tealight Holder, Cast Iron, Antique Bronze Finish, New. Beautiful antique bronze finish. Wine all the time by pavilion gift company. 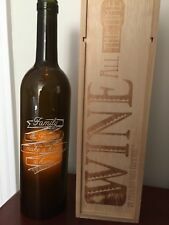 Wine bottle LED candle with the inscription “ Family & Friends make a house a home.” Great Yankee swap or holiday present. This is a Lot of 3 Candle Holders Decoration. Cracked Glass style. They are each around 1 1/2 lbs.